We are particularly looking for survivors coming to Malmö, Sweden on April 28, 1945 and in general arriving on March to May. If you are a survivor, who arrived to Malmö in this period or have information relating to the rescue of the survivors, please get in contact with us. April 28, 1945. Survivors arriving at the harbour in Malmö, Sweden. In January 2012, when Harbour of Hope was screened in Jerusalem a lady raised her hand afterwards. ”Excuse me”, she said. ”Did you see the little girl with a blanket in her hand, who just had came off the ship? It is me”, she told the astonished audience. It was an amazing moment when we realized that it’s still possible to identify survivors in the original archive footage from 1945. In Harbour of Hope we were able to present 8-year old Irene and newborn baby Ewa, carried by her mother. Now we want to continue our work with identifying survivors in the 67 years old archive footage from the arrival in Malmö, Sweden. And from the big amount of photos taken on April 28, 1945. The original footage belongs to SVT, the Swedish National Television, and was mainly shot during April 28, 1945. That day several hundreds of camp survivors came with ships from Copenhagen. Many of them came from the Ravensbrück camp, but also from other camps. Continuing identifying survivors in this historical material is important. We want to put names to the thousand of nameless faces we see arrive in the Malmö harbour. 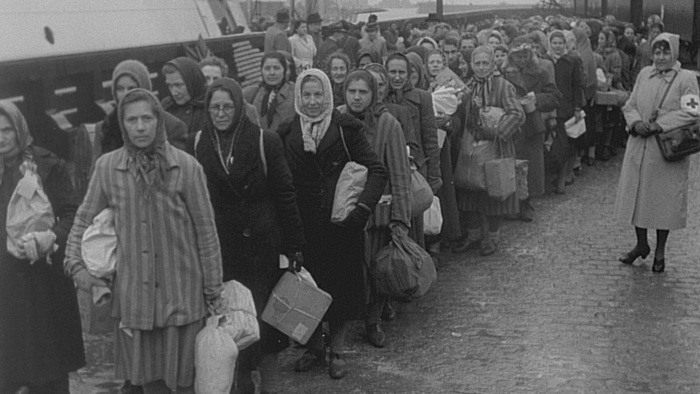 Please spread the word that we are looking for survivors who came to Malmö in April 28, 1945. There’s a chance that their arrival was documented by the photographers in the harbour that day. We are also interested in testimonies from survivors who came with the Swedish Red Cross mission to Sweden during the period of March to May and the refugees who came during the summer of 1945. We want to share their stories of liberation and starting a new life in Sweden. We are doing this in co-operation with SVT. At this point we don’t know exactly how we will present the results of our continuing research, but it might even end up in another documentary.